Walking the Moon with my own Photos - How Small Objects Can You Recognize on the Moon? On this page, I ask how small objects can be on the moon that you you still can recognize them. See also page Moon Walks which provides an overview of the "moon walks" and some information about the moon. When you take photos of the moon, of course, the question arises how small objects you can see or recognize on photos. Since I do not take enough time with visual observations and do not inform myself properly beforehand, the question remains, what can be seen on the photos. A quick empirical answer is that, in my photos, you can see minimum objects with a diameter of 10 to 20 km. The image resolution seems to depend less on the magnification (also through the camera optics), but rather on the telescope itself, i. e. its aperture. Since the aperture determines the resolution of telescopes, my first impression is no surprise. In the following, I will extend the question to the eye, visual observation with the telescope, the Atik Infinity camera at the telescope, and a digital camera at the telescope using the 1:50 or projection method. What Does the Naked Eye See on the Moon? Thus, with a lunar diameter of 3,476 km and a field of view of approx. 30' (0.5°) = 1800", an arc second would result in a distance of approx. 2 km (1.93 km). 120" = 2': corresponds to 231.73 km. What Do I See with my Telescopes on the Moon? We already know that an arc second corresponds to a distance of about 2 km (1.93 km). Depending on the aperture, my telescopes have a theoretical resolution between 1.61" (2.8" tube) and 0.77" (6" tube). This would correspond to moon structures between 1.5 and 3.5 km, which are considerably smaller than I can perceive in practice. Now the question is, whether my eye is able to resolve that. To answer this, I need to know which magnification is used, because depending on which resolution I assume for the eye, the moon structures have to be between 20" and 180" in size (or even larger) so that I can recognize them. 3.48 km for 180" (3'), 2.32 km for 120" (2'), 1.16 km for 60" (1') and 0.39 km for the theoretical resolution value of 20". 2.32 km for 180" (3'), 1.54 km for 120" (2'), 0.77 km for 60" (1') and 0.26 km for the theoretical resolution value of 20". At this magnification, 180" (3') is also sufficient to get close to the theoretical resolution of my 4" telescope (1.15" according to Dawes). According to the authors, these are, however, theoretical resolution values that have to be doubled due to practical conditions (air turbulence, quality deficits of the telescope) most of the nights. Thus, 4" telescopes should be able to show objects having a size between 900 m (grooves) and 1.5 km (craters) on the moon. Note: I tried to understand how the values in the authors' book are generated and found that they do not double the factor 39 or 23 in their calculations (as they do when presenting resolution values). *) Based on Spix & Gasparini's book Moonhopper, where they use an eye resolution of 1' (beneficial magnification = aperture in mm / 2) for all telescope types, I use a resolution of 1' for the calculations. These values are not identical with the "bM" values where I used the exact Dawes factor of 116 (in this column, I use 120 for "simplicity). I also provide "rounded" beneficial magnifications for the typically used resolutions of 2' and 3'. ***) The italic values in column "2'" correspond to doubling the constants in the resolution formulae given by Spix & Gasparini in their book Moonhopper; these are the values that are to be compared with the values calculated above! Comparison of moon distances: Luckily, the distances here (the italic values) match the values calculated above! 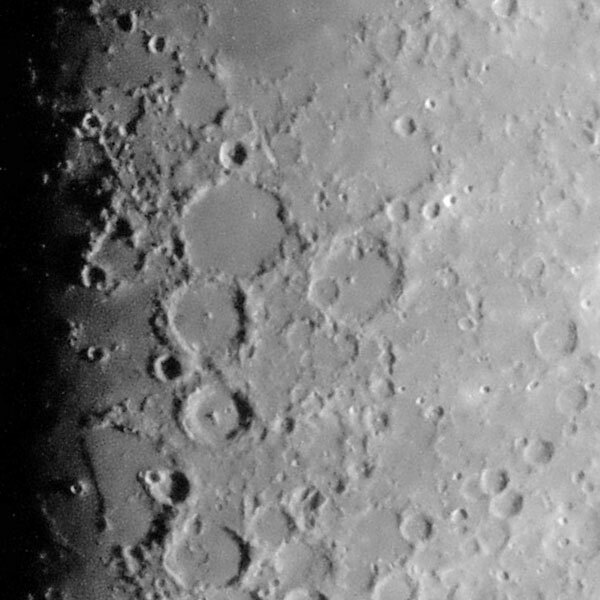 Magnifications: The beneficial magnifications for craters are about in the order of magnitude of what I previously knew as "maximum usable magnification," which is, however, based on a resolution of 3'. I certainly tried these magnifications already, and so, using a new approach, I just landed where I have been before... For grooves, however, the beneficial magnifications are significantly higher. As a test, I already operated the Skymax-102 with a magnification of more than 300 x at the Sinus Iridum (Golden Handle), which was quite OK under the given conditions. In plain language this means, and as Spix & Gasparini write, you have to try, try, try... According to the authors, magnifications of more than 350 x can hardly be used in Central Europe. My eyepieces: When observing the moon, I often my the 32 mm and 24 mm eyepieces together with the Skymax tubes, the former one for photos, because it has a T-connector, the latter one for visual observations, where it displays the moon as a whole. According to the table above, depending on the resolution of the eye (or "concentrated" versus "comfortable" observation), moon distances of less than 10 km should be visible. So far, I have not checked whether I can actually see such distances with these eyepieces - another task for the future. I can almost photograph them, but I am more likely to recognize structures of a size between 10 and 20 km away (see below). First I had researched the question "What can I see on the moon" according to my own ideas, but then I came across Spix & Gasparini's book Moonhopper, which is my most detailed book on the "moon" topic. There, I found the above-mentioned special resolution values for moon structures as well as practical "corrections." Much later in the book (on page 50), the authors discuss the related topic of "optimal magnification." In this chapter, they assume a visual acuity/resolution of the human eye of 1', for which they calculate the beneficial magnifications (while Stoyan assumes 3' for deep sky objects, and most of the information sources on "maximum magnification" assume 2'...). In addition, the authors calculate the beneficial magnifications for moon structures without applying the "practice factor" of 2. I first had to understand all this! What Does the Atik Infinity Camera "See" on the Moon? This depends, of course, on the telescope used. When I took a photo of the crescent moon with my Explorer 150PDS, the diameter of the moon was about 1080 pixels, which corresponds to 1800" or 3476 km. Thus, 1 pixel corresponds to 1.67" or 3.22 km. This is roughly double the distance that, except for my refractor, my telescopes can resolve. Thus, the Atik Infinity camera does not seem to exploit the resolution of my telescopes (except for the refractor). The question is what to include; in addition there are perspective distortions in the moon photos. These estimates are plausible. Better accuracy is achieved with large craters. 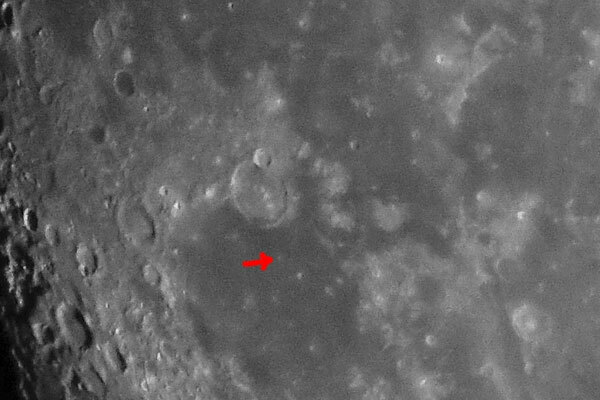 The small craters are used to determine the resolution limit. 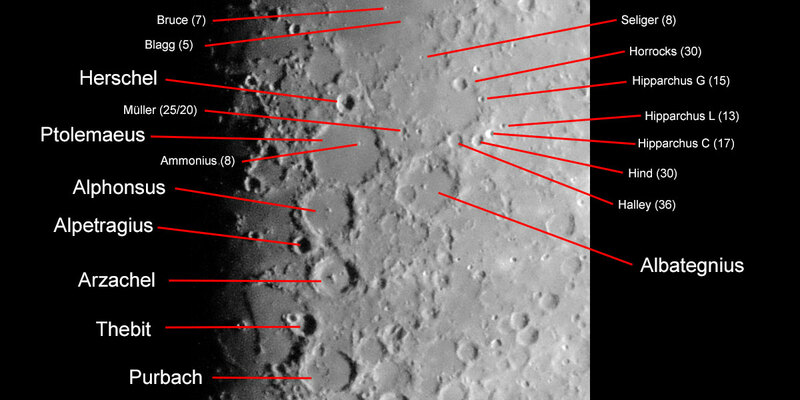 What Does a Digital Camera See on the Moon? I took most of my moon photos with a camera held or attached to the eyepiece. Here I discuss two photos taken with the Ricoh GR (16 megapixels, APS-C sensor) on the Skymax-102 and Skymax-127 (for the photos see below). This is more or less the telescope resolution, that is, the camera fits the telescope (the used Skymax-102 has a resolution of 1.15", the 150PDS one of 0.77"). 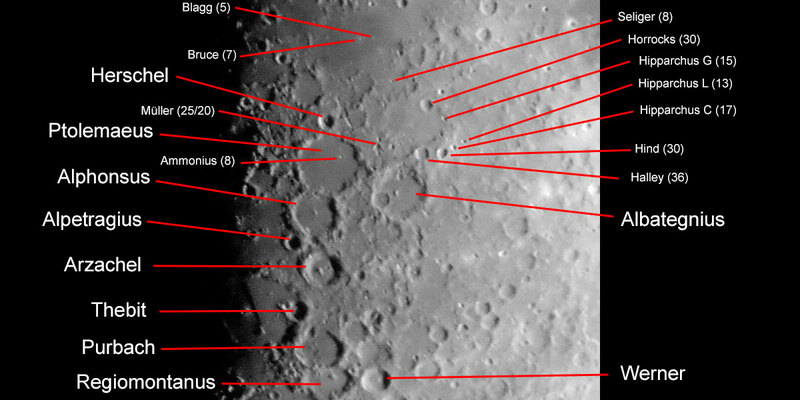 Crater Bruce corresponds to about 5 x 5 or 6 x 6 pixels, which would be 8.7/10.4 km; in fact, it is 7 km. Crater Blagg (5 km) can be seen in the photo, but not measured. 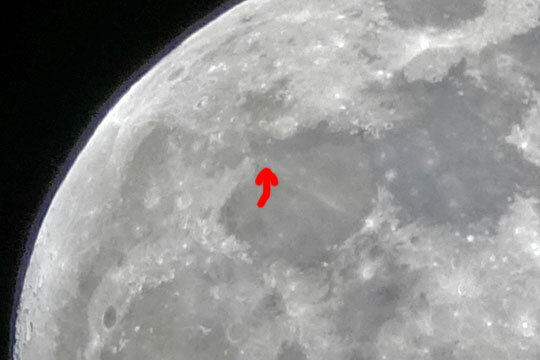 With small craters, the exact size is difficult to see. 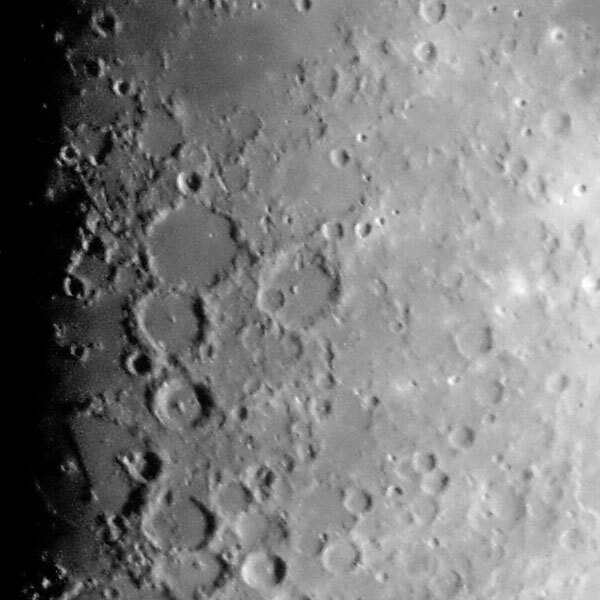 Ptolemy's crater is about 80 pixels high, maybe 90 pixels wide, that's 140/156.7 km; in fact it's 154 km, so that's about it. This is a little bit better than the telescope resolution, that is, the camera fits approximately the telescope (the Skymax-127 used has a resolution of 0.91", the 150PDS has a resolution of 0.77"). Crater Bruce corresponds to about 6 x 6 pixels, that would be 7.86 km; in fact it is 7 km. Crater Blagg (5 km) is practically not visible in the photo. 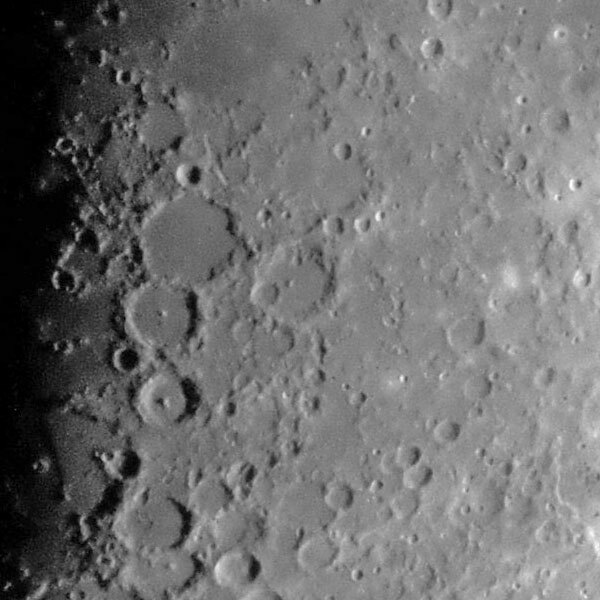 Ptolemy's crater is about 120 pixels wide, that's 157 km, in fact it's 154 km, so that's about it. These estimates are plausible. 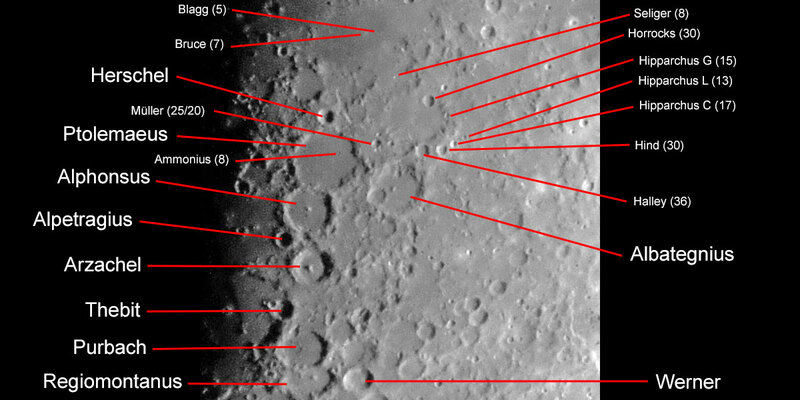 Higher accuracy is achieved with large craters, the small craters are, however, needed to determine the resolution limit. After a little more searching and viewing of the original photos I found (preliminarily) out that objects between 5-7 km diameter can be "guessed" and objects of 8 km diameter or more can be recognized (see photos below). This is certainly only true for the better photos like the ones below. What Does a Digital Camera Alone See on the Moon? I would like to answer this question for my Sony RX10 M3, which has a focal length of 600 mm (equivalent). But with that it just has 20% of the focal length of the Nikon Coolpix P1000, which holds the (equivalent) focal length record as of today (February 2019). Moon diameter approx. 875 pixels corresponding to 1800" or 3476 km >> 1 pixel corresponds to almost 2.1" or 4.0 km. This is significantly below the resolution of my Omegon PS 72/432 refractor, which has a resolution of 1.61". So I almost achieve what I can achieve with a telescope. Generally, however, it looks as if I can only see a fraction of the craters of this size.